From a seemingly endless cycle of catering to new devices, operating systems and networks to identifying the bottlenecks in a mobile app, the task of providing a flawless mobile user experience can be a daunting one. Don’t worry, it's not as hopeless as it sounds. 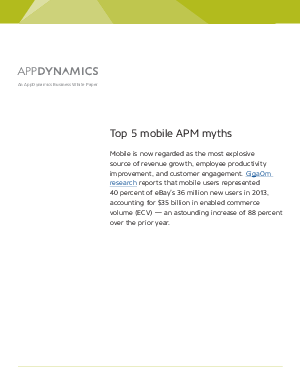 Download this whitepaper to learn the top 5 myths about mobile APM so with the right mAPM tool, you can nail your mobile app experience — both interactivity-wise and performance-wise — and in turn, win the market.